The front-end developers always search for new techniques to improve their experience. We find out some more advanced CSS techniques with tutorials that can improve your skills and enhance your workflow. Today we present some brand new released CSS techniques, tutorials and tools for you to use. Enjoy! 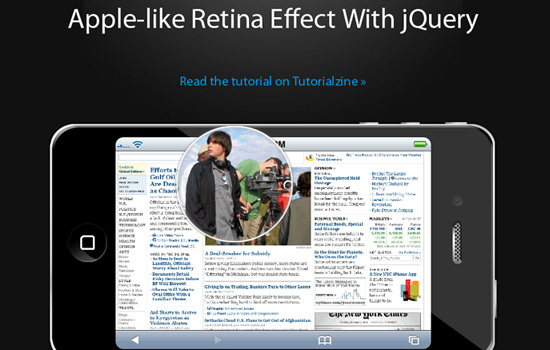 New features introduced in CSS3 allow developers to create stunning visual effects. 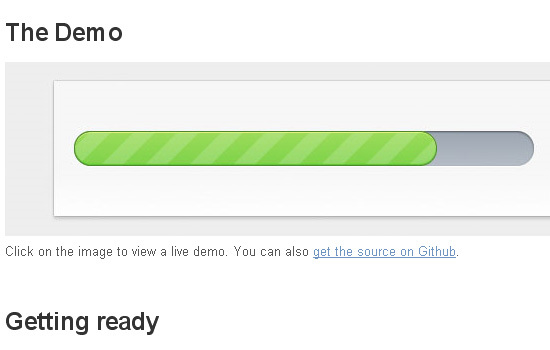 You can create a fancy progress bar using CSS3 and jQuery, but no Flash or even images. â€œThe other day I was trying to style CSS3 border-radius to image element and I realized that Firefox doesn’t display border-radius on images. Then I figured a way to work around it â€” wrap a span tag around with the original image as a background-image. The first, its header navigation and branding feels right with its fixed-width layout. The second â€” the article content getting most the discussion, and the one redesigned for readability â€” cries out to be fluid. 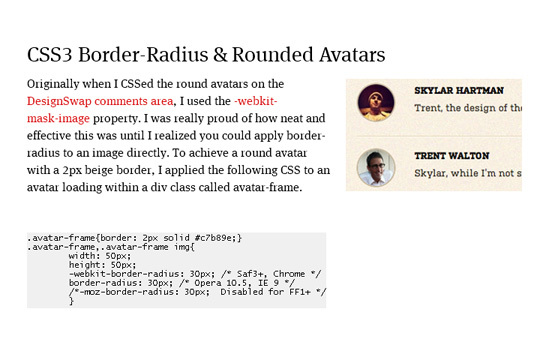 Originally when I CSSed the round avatars on the DesignSwap comments area, I used the -webkit-mask-image property. I was really proud of how neat and effective this was until I realized you could apply border-radius to an image directly. 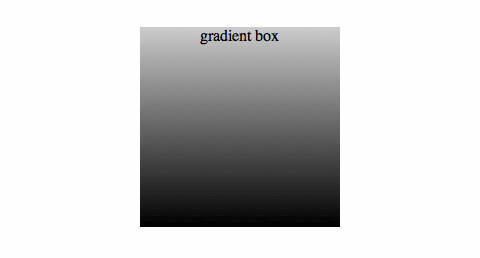 To achieve a round avatar with a 2px beige border, I applied the following CSS to an avatar loading within a div class called avatar-frame. Visual aesthetic might be a personal biased but, even so, there seems to be some fundamental CSS issues as well. Below is a sample case. 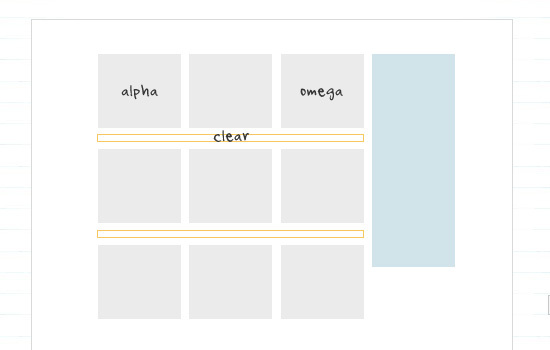 To achieve the layout result Iâ€™ve designed here, with 960gs, you will be required to add extra CSS classes: alpha, omega, and clear. The alpha & omega class is required to get rid of the margin space on the left and right hand sides of the columns. A clear class is also required to clear the floats after each row of columns. What made me wonder is if it was possible to turn this static image into a fully functional â€œRetina effectâ€ with only jQuery and CSS. This is exactly what we are doing today. So grab the demo files from the button above and read on. Create a beautiful 3d bar chart. Several bars placed under each other. 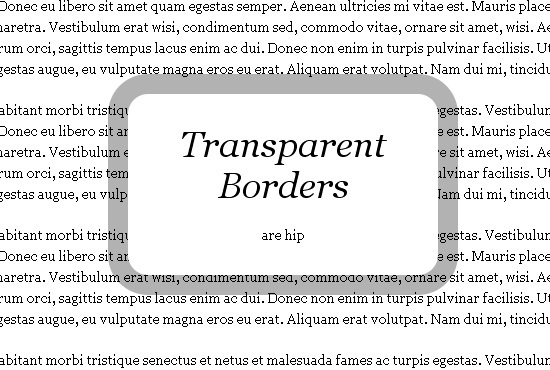 When hovering, the animation shows and the bar will grow to the appropriate size. 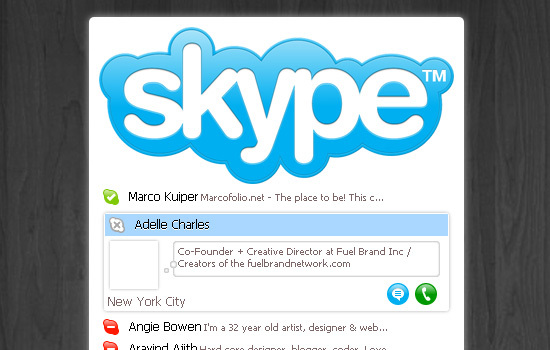 Transfer the amazing slick Skype (for Mac) layout to your own webbrowser. Not the full layout: Only the menu where all your friends are listed. For the nifty layout we’re going to use CSS3 and for the extra functionality (ofcourse) jQuery. 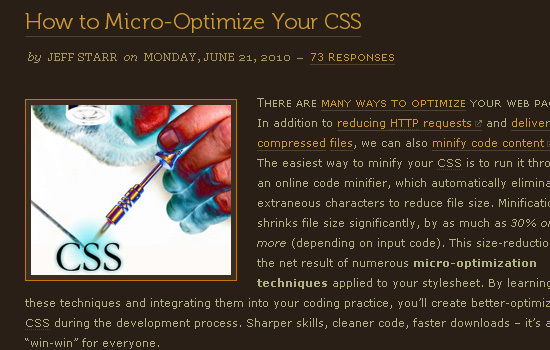 The easiest way to minify your CSS is to run it through an online code minifier, which automatically eliminates extraneous characters to reduce file size. 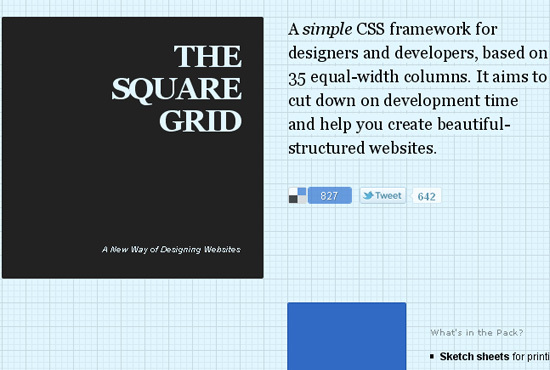 A simple CSS framework for designers and developers, based on 35 equal-width columns. It aims to cut down on development time and help you create beautiful-structured websites. 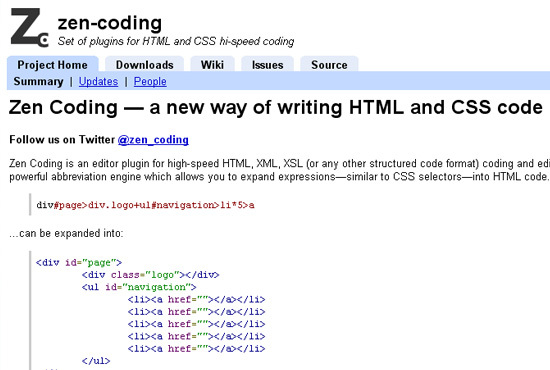 Zen Coding is an editor plugin for high-speed HTML, XML, XSL (or any other structured code format) coding and editing. The core of this plugin is a powerful abbreviation engine which allows you to expand expressionsâ€”similar to CSS selectors into HTML code. 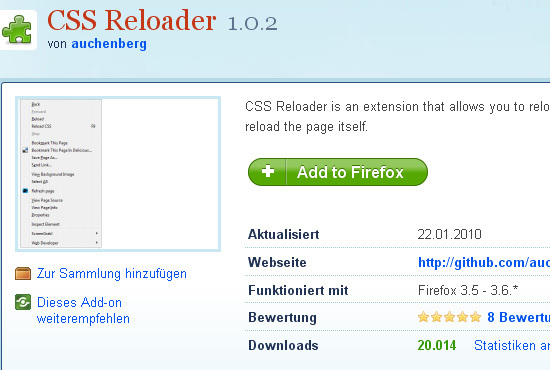 CSS Reloader is a browser extension for Mozilla Firefox and Google Chrome, that allows you to reload all the CSS of any site without you have to reload the page itself. 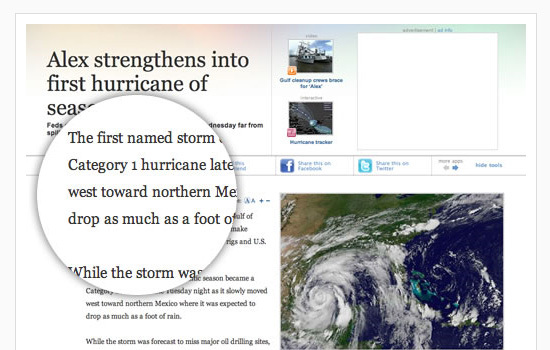 The goal for this browser extension is to enable developers to become more productive. 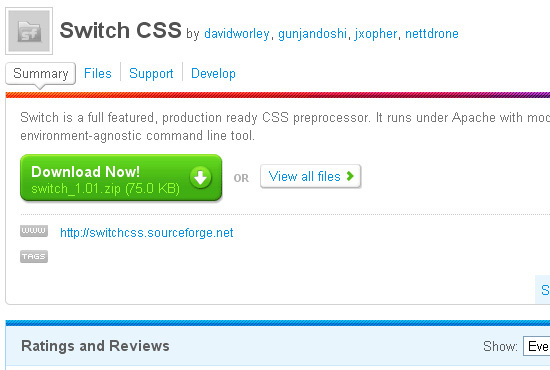 Switch is a full featured, production ready CSS preprocessor. It runs under Apache with mod_python, or as an environment-agnostic command line tool.